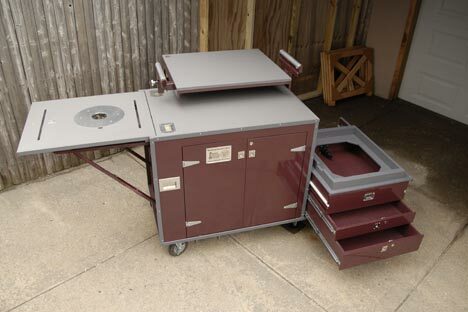 I have worked with a few union carpenters and cabinet installers over the years, and one thing I have learned is that they love their work carts. I am not talking about those little plastic carts, I am talking about a complete workshop on wheels. For the most part they convert some other type of cart to fit their needs, but in some cases they build their own. So it is not surprising that Portable Carpentry Workshop (PCW) was designed by a union carpenter to meet all of the carpenters common needs; after all he should have a pretty good idea what people are looking for. The PCW is designed to maximize setup time; because all of your tools are already on board and in place, all you have to do is plug the thing in and you are good to go. It holds all of your major tools, including your miter saw, table saw, and even has a built in router table. The miter saw table is mounted on glides so that it can be pushed back to make room for the table saw out feed or extra routing space. Underneath there is plenty of room for your other power tools, and there are two drawers under the table saw mount for your hand tools. This cart is no light weight, so if you plan on using it on a job you better make sure you are working on a single level building, or you have access to an elevator. A ramp or a friend to get the PCW loaded and unloaded from your truck or van is also probably a good idea. The PCW might also be a good solution for the person at home that likes to create, but doesn't have all the space needed for a full shop. You can wheel it out of the garage onto the drive way, and be set up and ready to go.